​UCLA In the News lists selected mentions of UCLA in the world’s news media. See more UCLA In the News. 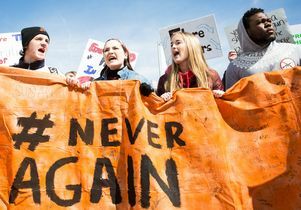 Current high schoolers’ interest in politics did not happen overnight, says John Rogers, director of the Institute for Democracy, Education, and Access at the University of California, Los Angeles. They have come of age in the shadows of the Black Lives Matter movement, LGBTQ advocacy, and Dreamers legislation — all societal issues that are relatively easy to understand and spread quickly on social media. The UCLA Institute of the Environment and Sustainability held its annual gala Thursday night with celebrities, philanthropists, and business leaders to raise funds to protect the environment. In attendance at the event, held at Jeanne and Tony Pritzker’s home in Beverly Hills, Calif., were CNN commentator Van Jones, and actor Pierce Brosnan along with his wife and philanthropist Keely Shaye Brosnan, who were all being honored by the UCLA IoES for their environmental work. Adam Winkler, a constitutional law professor at the University of California, Los Angeles, told PolitiFact that it is accurate to say the Obama administration approved the sale of bumps stocks. ”Not because they liked it, but because the law did not permit them to prohibit it,” Winkler told the fact-checking organization, which explored the issue after the National Rifle Association said in October that the Obama administration approved bump stocks on two occasions. Accurate counting of Alzheimer’s cases is difficult, said Ron Brookmeyer, professor of biostatistics at the UCLA Fielding School of Public Health. … “Different researchers can use different thresholds, and that can really impact the numbers,” Brookmeyer said. Among the family members who provide “informal” care for aging parents not in long-term care facilities, 70 percent are daughters, said Kathleen McGarry, professor of economics at the University of California at Los Angeles, and a research associate at the National Bureau of Economic Research. “So many of our plastic products that come in contact with food and beverages are made with endocrine-disrupting chemicals that leech into the environment and end up in our bodies in measurable quantities,” Nancy Wayne, Ph.D., a professor of physiology and reproductive endocrinologist at the David Geffen School of Medicine at the University of California at Los Angeles, told Healthline. “I cannot tell you how many patients I have seen who have had very bad filler,” says [Brent] Moelleken, a clinical associate professor of surgery at UCLA’s David Geffen School of Medicine. Dr. Nader Pouratian [is] chief of functional neurosurgery at the David Geffen School of Medicine at the University of California Los Angeles (UCLA). “Normally, there are three main things in the head: the brain, blood, and spinal fluid,” Pouratian told Healthline. “During brain surgery, some spinal fluid rolls out.” An air pocket will occupy what used to be brain space.